NEW YORK, Jul 9 2007 (IPS) - One person may not be able to save the world, but former U.S. Vice President Al Gore won’t give up his quest to do so without a fight – make that a green revolution. 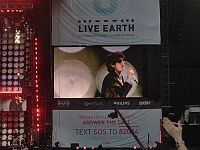 Saturday’s 24-hour Live Earth concert series spanning seven continents and predicted to reach 2 billion people marked the beginning of a multi-year campaign led by Gore’s Alliance for Climate Protection to drive public action toward solving the climate crisis. Hailed by organisers as the largest concert ever, the event stemmed from Gore’s famed slideshow detailing the dangers and realities of “an inconvenient truth” otherwise known as global warming. “Al Gore’s slideshow reached thousands, [the subsequent documentary] ‘An Inconvenient Truth’ reached a few million, and Live Earth is all about engaging billions of people,” Live Earth spokesperson Yusef Robb told IPS. Precise figures regarding the concert’s overall reach will take weeks to tabulate, according to Robb, but MSN has already reported that, with well over 10 million viewers in cyberspace tuning in for one of the 21 different languages broadcasted, Live Earth has become the most simultaneously viewed online concert ever. With Live Earth founder and producer Kevin Wall working behind the scenes, the concert’s success should come as no surprise to those familiar with his previous mega endeavours, which included Live 8 in 2005 and Live Aid in 1985. Q&A: "Species Are Moving Southwards"
Saturday’s concert, with venues in New York, Washington DC, London, Johannesburg, Rio de Janeiro, Shanghai, Tokyo, Sydney and Hamburg, drew a wide array of performers who volunteered their vocal cords to make a difference. Nunatak, a band of scientists from the British Antarctic Survey, even performed to a handful of employees on the frozen tundra. Awareness about the event was recently bolstered by several Live Earth partnerships ranging in scope from conservation organisations like the World Wildlife Fund to corporate sponsors including Philips Electronics. Organisers at Live Earth did just that, incorporating as many innovative energy-saving devices and recyclable materials into the concert’s framework as feasibly possible. Several earth-friendly measures included using energy efficient LED lights, powering generators with bio-fuel, serving up snacks with biodegradable cutlery, installing organic soap pumps in the restrooms and constructing stages from recycled materials. Several venues, including Hamburg and Sydney, even provided public transportation to the concert upon ticket purchase. Despite the successful implementation of these environmental considerations to cut down on waste and consumption, critics of Live Earth, including Roger Daltrey of the Who, have ostracised the event for using excess energy to promote conservation. Live Earth organisers responded to cries of hypocrisy by pledging to purchase carbon credits to offset the concert’s environmental impacts, essentially creating a carbon neutral event. Brand Neutral, a company devoted to helping clients reduce costs and maximise energy efficiency, lent its support and sustainability expertise to Saturday’s event to ensure carbon neutrality. “We deeply respect Al Gore and Kevin Wall and wanted very badly to roll up our sleeves, get to work and make a difference,” Brand Neutral founder Tom Feegel told IPS. As part of the Live Earth Call to Action, a series of commitments that concert organisers and the Alliance for Climate Protection are pushing on the public, the seven-point pledge was repeated several times by celebrities and activists at every major venue around the world. In New Jersey, Al Gore urged concert goers to sign the pledge, committing themselves to becoming carbon neutral, increasing the energy efficiency of their homes and fighting for a moratorium on new coal-burning facilities that do not engage in carbon sequestration, among other environmentally progressive actions. “The massive outpouring from the seven-point pledge will certainly be conveyed to leaders all over the world,” Robb told IPS. Although Saturday went smoothly for concertgoers and organisers, the weeks and months leading up to Live Earth were marked by scepticism and a great deal of the unknown at several venues. A scheduled concert in Istanbul was recently cancelled due to general lack of interest, and one at Copacabana Beach in Rio de Janeiro nearly suffered a similar fate last week due to security concerns before a last-minute court order saved the free venue that would go on to draw the largest crowd of all, estimated in the hundreds of thousands. All proceeds from ticket sales will go toward the Alliance for Climate Protection, but organisers prefer not to think of the event as a benefit concert. Millions of people joined the movement in their own ways by sponsoring or attending one of the more than 10,000 Friends of Live Earth events in 130 countries on Saturday. Friends of Live Earth is an official Live Earth programme designed to build a worldwide community-level movement to combat the climate crisis. Robb told IPS that events ranged in scope from watching the concert at home with friends, to parties and smaller concerts attracting thousands of people. “A lot of times, environmental issues are wrapped in gloom and doom. This is a way for us to come together, have a big party, enjoy ourselves, and hopefully something will come out of it in terms of substance,” he added.